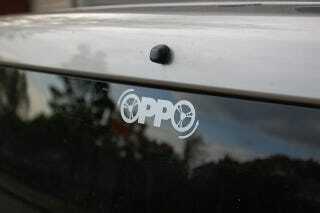 Oppo & other stickers on the fleet. Got some stickers in the mail, so plastered them on our cars. Box got a silver Oppo sticker. He also got Calvin & Hobbes riding in a box. I've had this sticker on nearly every car I've owned. Given my xB is known as "Box" it is doubly appropriate here. The girlfriend's xB also got a C&H sticker. The truck also got an Oppo sticker. It looks really strange as it is the only part of the truck that isn't faded & grimy. While the glass looked clean, it turned the paper towel black when I went to clean the spot for the sticker.